A guest post by Blanche Helbling, KPB Photographer Extraordinaire! If you followed Keep Philadelphia Beautiful’s social media pages this summer, we hope you enjoyed our weekly photo post highlighting the efforts of local #ZeroWaste superstars (psst…you can see the photos here, in our Facebook album). As the photographer, I was thrilled to meet each and every one of the folks featured in the series. Not only were they “models” in the sense that they posed for photographs, but I hope that they have also served as zero waste “role models” for Philadelphians across the city. Broadly, the goal of the photo series was to initiate a conversation about how we, as individuals, can do our part to reduce the amount of waste that we generate. 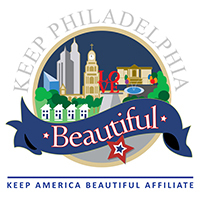 Keep Philadelphia Beautiful sits on Mayor Kenney’s Zero Waste and Litter Cabinet, and we’re proud to be part of the team working to reach his goal of eliminating 90% of the city’s waste from landfills by the year 2035 (pssst again – read more at CleanPHL.org). No doubt this is an ambitious goal. We live in a world of single-use coffee cups, fast fashion, plastic grocery bags…you get the picture. For every empty styrofoam to-go container you see idly blowing down the sidewalk, you can rest assured that there are bajillions more in landfills, where they’ll remain until they eventually break down into micro-plastics, which in turn make their way into our soil and waterways, never truly going away. Luckily, litter, landfills, and incinerators are far from our only options. I hope that the Zero Waste photo series conveyed the admiration and applause I have for those who are courageous enough to believe that they can help be the change that the city and the environment at large so badly needs. Even though one action– say, remembering to bring reusable bags to the grocery store– might seem small, many small actions together create a movement. And as the city says, zero starts with one. One person chooses to pack their lunch in a reusable container. One community group hosts a zero waste block party. One city achieves its zero waste goal. I won’t pretend this will all happen overnight. Philadelphia won’t be waste-free tomorrow or the next day or even next year. It will take a while, so it’s a good thing that it’s already started. This city is full of amazing people who make it their personal mission to reduce their own garbage in a myriad of ways. Through the photo campaign, we were able to highlight only a fraction of their efforts, but hopefully, we were also able to engage in meaningful dialogue about why they do what they do and what they hope to do next. All posts combined, we generated over 26,000 interactions on Facebook, Instagram, and Twitter. This is just the beginning of an ongoing conversation. If I’ve learned anything through this photo project, it is that Philadelphians have a knack for setting their minds to something and achieving it. If we all work together, that thing can be Zero Waste.